Want to protect your succulents from too much rain? Here’s how the Jardin Zoologique Tropical in southeastern France keeps their succulents from becoming waterlogged during seasonal rainstorms. Corrugated fiberglass panels atop metal bars tent the plants so excess rain doesn’t soak the soil. The structures are tall enough to allow good air circulation, and the panels are translucent, enabling maximum sunlight to reach the plants. 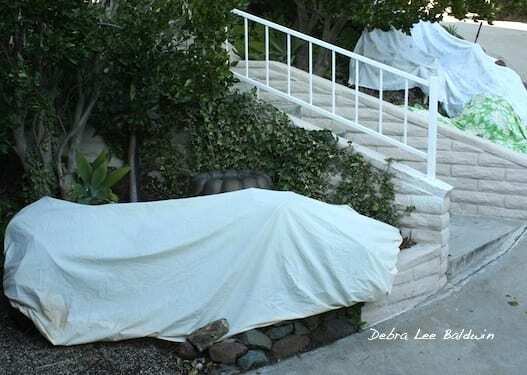 The covers, which have a horizontal metal rod atop them so wind can’t lift them, also protect tender succulents from frost. Notice, too, that the plants grow in rocky, elevated, sloping soil, so water drains away from the roots. You might do something similar in your own garden with a patio umbrella secured in a concrete base. But keep in mind that the water has to go somewhere. The French garden’s panels channel rain onto the gravel roadway nearby. Btw, this public garden, located near the village of La Londe-les-Maures, is deservedly proud of its succulent collection. Here’s a description from the website, courtesy of Google Translate. The common names of the plants are charming.